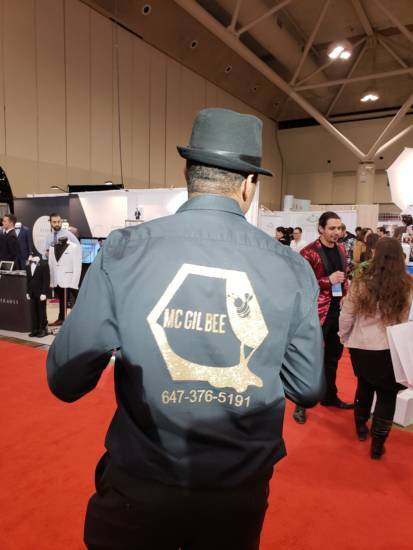 We were so excited to present MC Gil Bee entertainment services at Canada’s Bridal Show this year and connect with the happy brides and grooms! 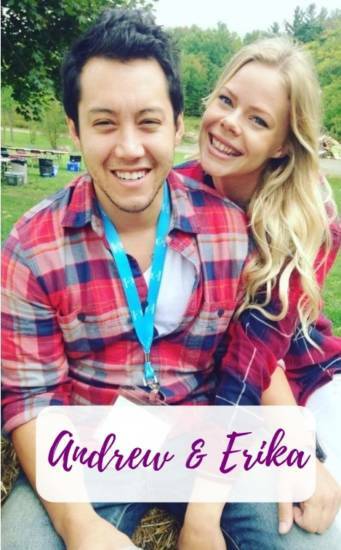 You guys have so much fun wedding planning ahead of you and we look forward to making your wedding perfect. EVENT EMCEE: MC Gil Bee does weddings, engagement parties, bar-mitzvahs, bat-mitzvahs, birthdays, anniversaries, fundraisers and other events! His sole goal is to make sure that you and your guests have the time of your life and remember the party forever! WEDDING DANCE PACKAGES: Head over to Access Ballroom to learn more about the Wedding Dance Package! In just 6 to 10 lessons, our expert dance instructors will help you make your wedding dance perfect. Just pick the song you would like to dance to. BRIDAL PARTY DANCE OR PERFORMANCE: If you want a surprise dance performance by your bridesmaids and groomsmen, Access Ballroom has you covered as well! PROFESSIONAL DANCE PERFORMERS AND ENTERTAINERS: Pick a dance style or music style you would like us to perform to. Then give us the date, sit back and enjoy the show! BACHELORETTE AND BACHELOR PARTIES: Did you know that you could take dance lessons together with your bridal party? This a great way to connect, have fun, and party it up! The Lucky winners of MC Gil Bee’s Draw at Canada’s Bridal Show 2019! MC Gil Bee loves giving away prizes! 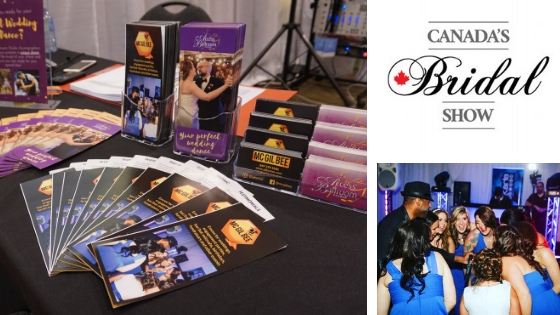 This time at Canada’s Bridal show we did a draw for the emcee services at your wedding. Congratulations to a beautiful couple Andrew and Erika who won emcee services from MC Gil Bee for their wedding! MC Gil Bee is looking forward to entertaining your guests and making your event one to remember! Contact MC Gil Bee via email at info@gilbynoe.com to reserve the date as soon as possible. *To find out who the winners were for Access Ballroom’s first wedding dance lessons, click here. Some of Canada’s Bridal Show attendees were curious to ask these questions and here are the answers! Why Should I Hire a Professional Emcee for My Wedding? First, not having an emcee at all is a huge mistake! You do want to have a designated person to make announcements and introductions, hype up the crowd, and get your guests involved. Second, many people have their friend or a family member emcee their wedding. 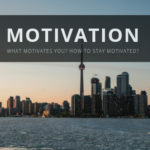 While this person may know you very well and be excited to take on the responsibility at first, they might not realize all the ins and outs of this job. Moreover, it is a lot of pressure on their shoulders, and they will be unlikely to relax and enjoy the party. It is even worse when that person has a double job. For example, Best Man and Emcee or Maid of Honor and Emcee. Do not make them go through that! Finally, a professional has done it so many times that they know exactly how to communicate with a large number of people, entertain and keep the party going. What’s the difference between a DJ and an emcee and how is MC Gil Bee different? Some DJs include emcee services in their package, which is great. However, by default, a DJ has to stay on the spot at his/her station. An emcee, on the other hand, can move around. This allows him/her reach out to many more guests and entertain everyone in a more cohesive manner. MC Gil Bee goes above and beyond to keep your guests entertained. At cocktails before the reception, he goes around to introduce himself to the guests, joke around, snap a few pictures of them, and get them to feel comfortable. During the reception party, MC Gil Bee not only makes intros and announcements but also keeps the dance floor full. Even the shy ones break it down when MC Gil Bee is hyping up the crowd. An expert choreographer and dancer versed in 18 different dance styles, he always makes sure to entertain your guests with some dancing. 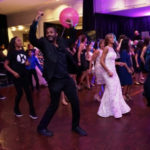 It can be him doing the Michael Jackson famous moves, or dancing Salsa or Cha Cha with the ladies, or getting your bridal party to participate in a dance contest or a mini dance lesson.